Two pieces of China's valuable cultural past, the bronze heads of a rabbit and a rat, stolen from the Old Summer Palace by British and French forces during the second Opium War in 1860, are scheduled for auction in Paris Wednesday night. Long before the auction, the Chinese government, cultural heritage organizations and lawyers have been actively pursuing the return of the Chinese treasures. However, at this specific moment, the owner of the bronzes, French businessman Pierre Berge, offered to swap the two sculptures for the application of human rights in China and the freedom of Tibet. From the Chinese point of view, it's an absurd requirement by abducting China's cultural relics with human rights issues. It's a big irony that Berge uses the bronzes, the exact evidence of human rights abuses done to the Chinese by British and French colonists more than a century ago, to ask China to apply human rights. 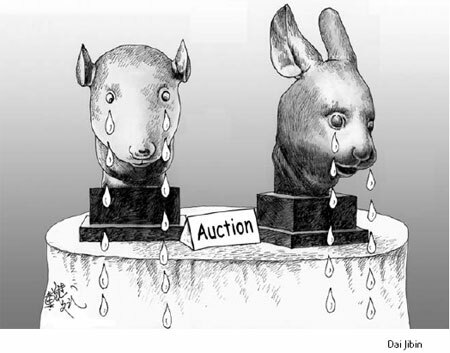 In 1860, the British and French forces used guns and cannons to invade Beijing, sacked and burned the grand Old Summer Palace on the outskirt of the capital and stole numerous Chinese cultural treasures, including the 12 bronze animal heads. In the next year, the great French litterateur Victor Hugo wrote: "Two robbers breaking into a museum, devastating, looting and burning, leaving laughing hand-in-hand with their bags full of treasures; one of the robbers is called France and the other Britain." He hoped that one day France would feel guilty and return what it had plundered from China. In the echo of Hugo's just condemnation and in face of his broad humanitarian sentiment, it is kind of narrow-minded and funny for Berge to offer to trade with someone something that actually belongs to that person. The Chinese government has always paid great attention to the recovery of its lost cultural relics. It is the international community's broad consensus and the basic, inalienable right of the relics' original homeland to protect their cultural heritage and promote the return of relics, a right making up an important part of human rights. Berge's decision to put the stolen treasures up for auction has deeply hurt the Chinese people's cultural rights and national feelings. His linking human rights to the return of the bronzes is also an irony to the international cause of human rights issues, as it is an infringement upon "the Chinese people's cultural rights under the pretext of human rights," as Chinese Foreign Ministry spokesman Ma Zhaoxu put it.